Digital billboard on Westwood Blvd. at issue in Clear Channel, CBS lawsuit. It has since been turned off by court order in another case. Three years ago, the West L.A. Area Planning Commission unanimously upheld challenges to the issuance of permits for three digital billboards in the Westwood area. In response, the billboard companies sued the city and named the four community groups that originally filed the challenges as real parties in interest in the lawsuit. Now, in the wake of a judge’s “pull the plug” order that has turned all but two of the 101 digital billboards in the city dark, the companies have dropped the lawsuit that sought to overturn the planning commission’s action. 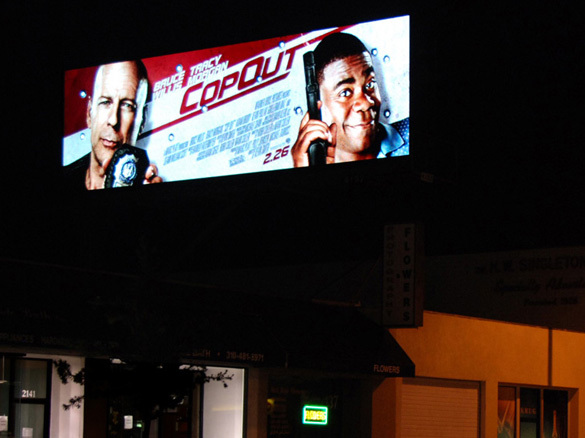 The three billboards–two on Westwood Blvd., and one on Santa Monica Blvd.–were included in the judge’s order. The permit challenges, filed with the city’s Dept. of Building and Safety in 2008, claimed that the digital billboards violated local zoning ordinances. A zoning administrator upheld two of the three challenges in 2009, and the planning commission voted in favor of all three early in 2010. Two of the billboards were owned by Clear Channel and one by CBS Outdoor. After the companies filed their lawsuit, three of the four community groups–the Coalition to Ban Billboard Blight, the Westwood South of Santa Monica Homeowners Assoc., and the Comstock Hills Homeowners Assoc.–retained attorneys to represent them in the court proceedings. The fourth group, the Westwood Homeowner’s Assoc., didn’t join the action. The ultimate fate of the three digital billboards as well as the others now dark remains to be seen. The judge who issued the shutoff order is scheduled to hear a motion in September asking that Clear Channel and CBS be ordered to entirely remove the billboards converted to digital under a now-deemed illegal lawsuit settlement with the city in 2006. The Coalition to Ban Billboard Blight has asked the court for permission to file an amicus brief supporting an order to demolish the billboards. In the meantime, Clear Channel is pushing forward with an intensive lobbying effort aimed at getting the city to agree to a deal that would legalize those billboards and allow them to be turned back on. No such deal has come before the City Council, but it is known that the companies have offered to take down some conventional billboards and give the city revenue in exchange for being allowed to operate the threatened signs. L.A.’s Digital Billboards Go Dark: What’s Next?